I wanted to be able to share playlists of music on my web site. Ideally I wouldn’t have to host the music itself but could instead point to different sources like youtube, soundcloud, ex.fm. After some research, Minilogs seemed to be the best solution. The site appears to have started around Spring 2012 but it was mentioned in LifeHacker recently and has a more thorough write-up at The Next Web. It’s exactly the solution I was looking for and there doesn’t appear to be any competitors at the moment. To embed on your own web page: create the playlist, register, click the share option, and paste in the <iframe> markup. 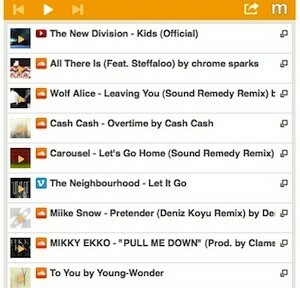 Notice the different icons for Youtube, soundcloud and vimeo – all playing together nicely. Softaculous (e.g. kplaylist) – I’m hosted on Namecheap and they have Softaculous for quick installs. Softaculous has a music category but the four options are php music library managers with out-of-date user interfaces. CloudPlay – Looks like an interesting option for building and listening to playlists across different sources on the web, but is a desktop application. Ex.fm – has an embedded player but it doesn’t appear that you can create custom playlists. This entry was posted in Music, Tech on December 20, 2012 by mclaffey.